An industrial air cannon, or air blaster, is an air-expansion type flow-aid device that utilizes a pressure-rated reservoir of stored compressed air or nitrogen at 10 to 125 PSI (150-PSI rated reservoirs available), equipped with a fast-acting, high-flow discharge valve which quietly supplies an instantaneous blast of air into bulk materials handling storage or process vessels, bins, silos, chutes or ducts. When strategically located and properly controlled (automatically or manually), the eruptive force of the air blaster de-clogs, dislodges, or prevents bulk solids build-up and blockage that chokes plant productivity and efficiency. 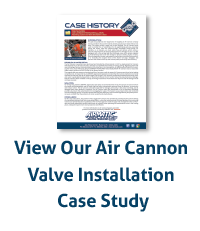 The air cannons are connected to the vessel or chute walls via strategically located pipes and engineered nozzles, which are positioned to direct the blast energy toward the outlet or direction of flow. They are rugged, weatherproof, dustproof, easy-to-use, and extremely dependable. In addition, they are safer, more productive, and significantly more cost effective than manual lubrication. The problem of over - and under - lubrication caused by manual lubrication grease guns, which results in pneumatic bearing failure, is eliminated. Auto-Lubers are installed in almost any position. The number of air cannons needed, their installation locations, and their firing sequence is based on the size and shape of the vessel, chute, or duct, the flow properties of the powder or bulk solid being disrupted, and the type of bulk solids flow problem that exists, ie, arching, bridging, clinging, or rat-holing / tunneling. Air Blasters are regularly used for bin cleaning, bin de-clogging, and as bridge breakers to activate bulk solids flow in hoppers, silos, and chutes. (4) high temperature is a consideration, eg, rotary kilns for pyro-processing (MARTIN® Air Cannons work in temperatures from -20°F ambient to 2500°F vessel internal). Air cannons and blasters are widely used to solve the toughest material flow problems in large-scale storage and pressure vessels in electric power generation, mining of metal, coal, and minerals, and manufacturing industries processing powders and bulk solids such as cement, pulp and paper, and primary metals to name a few. 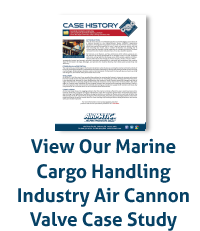 Air Cannons were pioneered by MARTIN ENGINEERING over 40 years ago, and MARTIN® continues to lead the field with advanced air blaster technology in positive pressure valve design as well as multi-valve and multi-port technologies that make air blaster cannons safer, more forceful, more efficient, and easier to install and service.